Anverso Efigie de la reina Elizabeth II y las palabras "Elizabeth II 100 Dólares 2019"
Efigie de la reina Elizabeth II y las palabras "Elizabeth II 100 Dólares 2019"
Moneda de Platino Britannia 2019 de 1 oz Order your 1 oz 2019 Britannia platinum coin from our online shop today to experience the Internet’s lowest price. As a time honoured symbol of sovereignty and a personification of the land of Britain, Britannia has graced the coinage of every monarch since 1672. 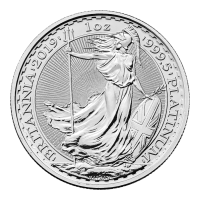 The coin's reverse features Philip Nathan's majestic Britannia design; she is shown in dazzling detail, donning her Corinthian helmet and holding her Union Jack shield and trident, keeping watch over the wind swept British Isles. Britannia is set against a dazzling field of micro engraved, star burst and dotted texturing and encapsulated in a border bearing details of name, year of origin, metal content, weight and purity. The obverse is equally striking, bearing a meticulous portrait of Elizabeth II, shown wearing her State Diadem and also set on a micro engraved field of light refracting dot texturing. Also on the obverse, Elizabeth II's regal title, as well as the coin’s denominational value. Over the centuries, Britannia has become a trusty symbol of British Minting and, as such, Britannia coins represent a sound and popular investment. Celebrate the spirit of Britain and enrich your portfolio with a 1 oz 2019 Britannia platinum coin today.